In the 20 years since our firm's founding, we have amassed a long record of success in all of our practice areas. Our success and dedication to the law have allowed our practice to continually grow. Our law firm is now home to four attorneys and a highly experienced legal staff, all of whom are highly respected members of both their local communities and the legal community. 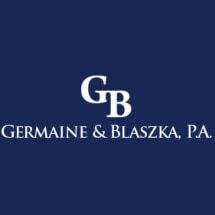 Whether you face a charge for a criminal offense, are considering filing for a divorce or have a legal need in one of our other practice areas, such as estate planning, real estate or business law, the attorneys at The Law Offices of Germaine & Blaszka, P.A., can provide personalized legal guidance and support to help you overcome your legal challenge. Find out more about how you can benefit from choosing our law firm to represent you by scheduling an initial consultation.